Miller, Robin and Hinnant, Kate. 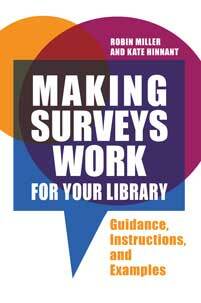 Making Surveys Work for Your Library: Guidance, Instructions, and Examples. Libraries Unlimited, 2018. ABC-CLIO, publisher.abc-clio.com/9781440861086. Instead of using expensive off-the-shelf surveys or relying on a poorly worded survey, read Making Surveys Work for Your Library and design your own that collect actionable data.